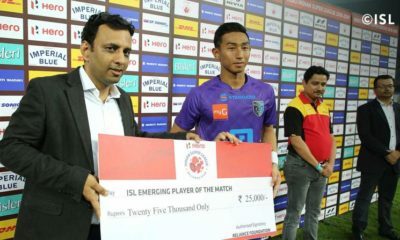 The build up story was that the champions were visiting the runners up, and the two managers, Mourinho and Pellegrini were resuming an intense rivalry. 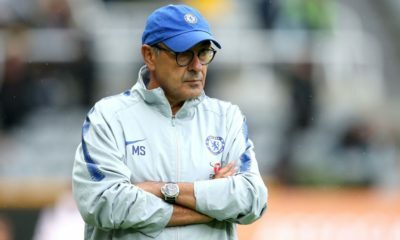 The post mortems however, were very different, as Chelsea fans lamented the lack of spirit and the utter fragility of their seemingly powerful squad. Manchester City dominated the game from start to finish, making a lasting impression in the minds of many, not least the current champions. Manchester City have been viewed throughout the last few seasons as a team who aim to keep tight possession in order to break through the opposition and create goal scoring opportunities. 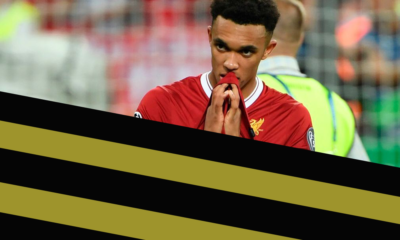 However, now with the signing of Sterling from Liverpool, they have the opportunity to be direct on both sides of the pitch. The introduction of Navas a couple of seasons ago had given City this energy but there has not been much consistency from Navas featuring week in week out. 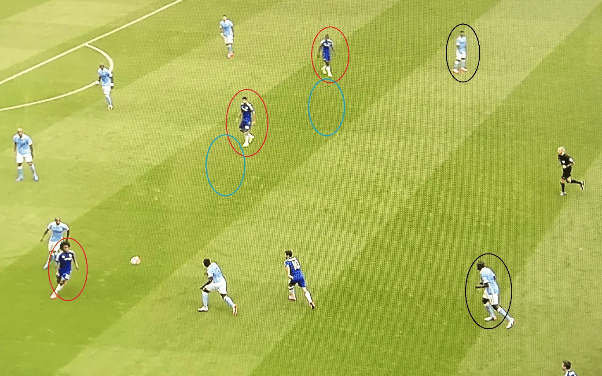 Within the game against Chelsea, both wide players were direct in trying to get in behind the back four of the current BPL Champions, but, the left hand side (side Sterling was on) had a combinational play approach also. Pictured below is an example of a combination on the left hand side. It is clear here, that City are trying to combine in a tight area to eventually get the ball into Aguero’s feet. 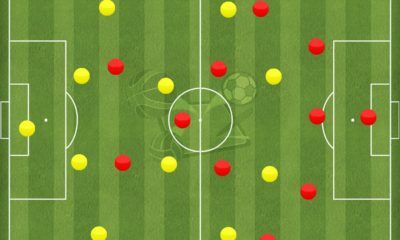 Movement to create space in this situation is important – it will make the combination quicker for where the ball is aiming to go. Silva – top left – has dropped from his NO.10 position to a deeper area than the left back, Kolarov. Yaya Toure is also offering deep support. The support from Silva and Toure is important as if Sterling can’t turn and go forward, he can simply pass the ball back and one of the two deeper players can switch it to the other side or play a direct pass to Aguero. 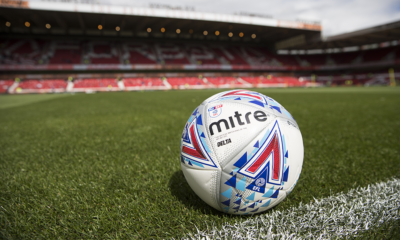 Above, we can see again the combination play on the left hand side of the pitch. The movement moving up to this was fluent by both Sterling and Silva. 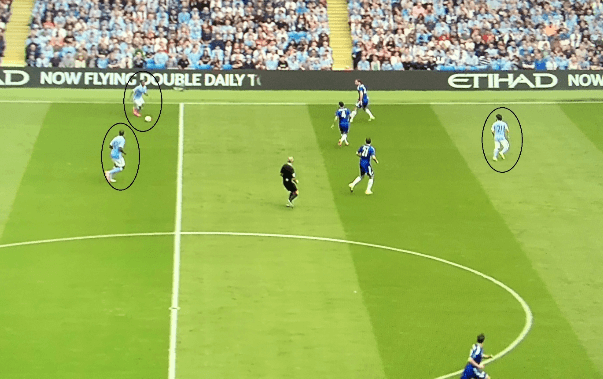 Sterling dropped low and in line with the CDM’s to receive the ball off Kolarov – with no Chelsea player marking him tightly. As this was happening, Silva moved into the ‘pocket’ (where Sterling was pictured in the last image). Silva would have had two aims from his movement: 1. Drag an extra midfielder out to give Sterling more space and time on the ball to either keep on running forward or make a dangerous pass, 2. 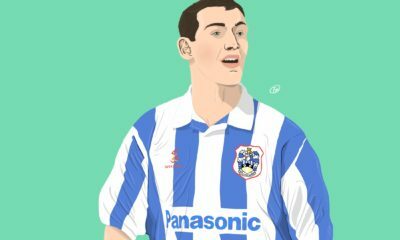 Move freely into an area where there are no defenders around him. 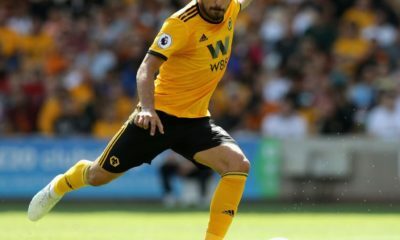 Silva achieved number two of the possible options. However, Sterling’s decision making was slow and he failed to find Silva in the ‘pocket’ but successfully switched the ball to Navas on the other side of the pitch. Man City were effective at combining down the left hand side of the pitch. 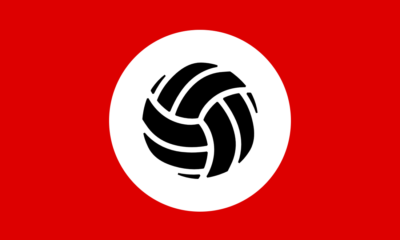 However, there were times when they could have gained dangerous attacks but didn’t realise the opportunity arising. 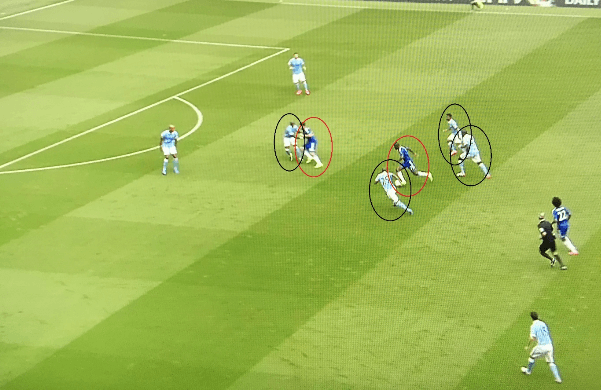 From the above image we can see once again that Silva is offering support deep if nothing arises for Sterling forward or Chelsea win the ball and attack the space in front – where Silva is already at. Aguero has moved into a wide area as Ivanovic has stepped up to press Sterling. Where is the space City can exploit here? Centrally. Both Fabregas and Matic have moved over with play to press for the ball and Hazard is too high up the pitch. 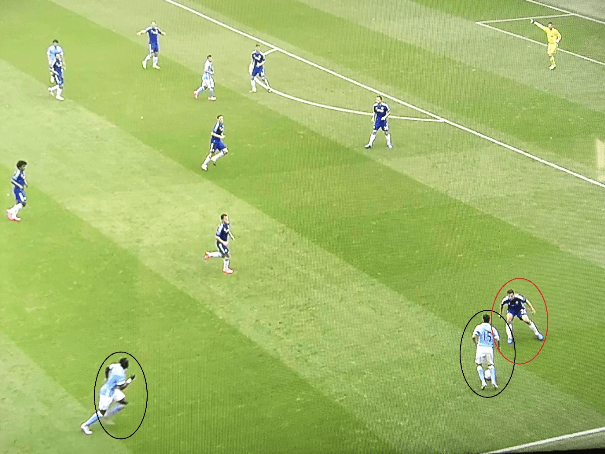 One way this attack could have proven dangerous would be if it was Toure supporting Sterling from deep and Silva made a disguised run into the space created from movement out wide. As the left hand side proved more dangerous when quick combination play was the approach compared to a direct style, the right hand side was opposite. Navas – seen as a one directional player – caused many problems for Azpilicueta. Compared to the left hand side, Silva isn’t in range to support Navas. However, he has a good amount of space in front of Azpilicueta to drive towards him, beat him and aggressively cross the ball into the box. With his pace and technical ability, I would say Navas has a good chance to beat the left back when this situation occurs. Throughout the game, Navas was quickly supported by the right back – Sagna – aiming to create 2vs1 situations. 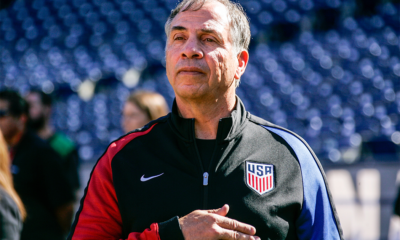 By doing so, it allows a cross into the box. This cross can only occur if the right back’s run is timed and the weight of the pass by the winger is appropriate for the full back to meet it first time. From the above image, it is clear Navas doesn’t have a lot of space to take advantage of before attempting to beat the Azpilicueta. In order to get in behind off Azpilicueta, Sagna is starting his overlap to create a 2vs1 situation. 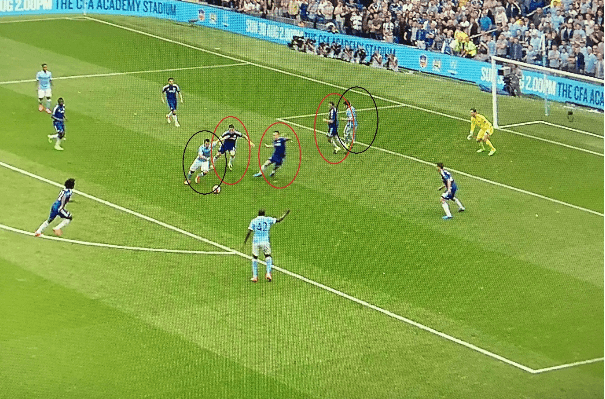 From this being created, City can still get a cross into the box. 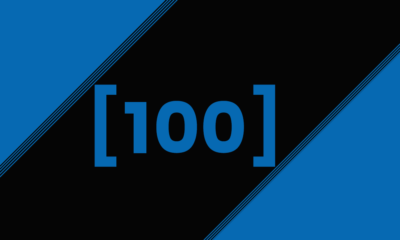 The two aspects of an overlap have been perfectly executed by City in this situation. The pass from Navas has been timed and so has the run from Sagna, allowing him to meet the ball first time to cross. Defensively for Chelsea, they have dealt with this poorly. 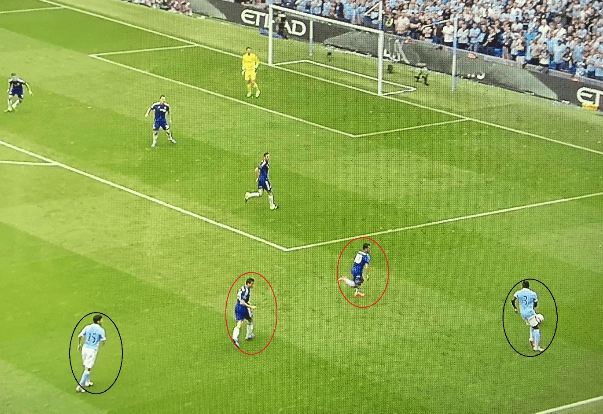 Azpilicueta didn’t cut off the pass to the overlapping right back – if he did, Navas would have been shown inside where a good number of Chelsea players were acting in a compact shape – and Hazard identified Sagna’s run too late. Throughout the game City defended well. Keeping a clean sheet and limiting Chelsea to a few chances. 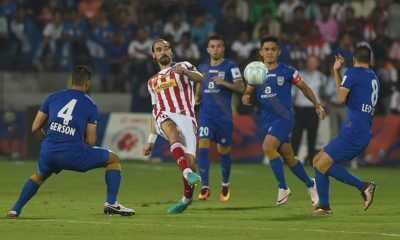 However, there were times the relation between the defensive and midfield lines wasn’t in co – ordination with one another. Luckily, Chelsea didn’t identify these situations throughout the game. If they did, the result may have been completely different. Costa has done well in this situation to lose his defender and turn with the ball. 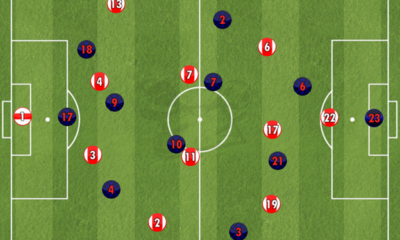 However, as play went on he failed to take advantage of the space in between City’s defensive and midfield lines. The blue circles are where both Kolarov and Sterling should have been once Costa received the ball. If Costa had identified the space and Kolarov and Sterling were out of position it could have been a dangerous moment for the light blues. Some may argue though, that Sterling shouldn’t be so deep when defending. But, if he wasn’t, Ramires would be in a large amount of space in front of City’s box. Anyway, Sterling is quick enough to be part of a counter attack if City won the ball back in this area of the pitch. Again, the situation occurred and Chelsea took advantage of it this time. Willian cheekily flicked the ball inside to Hazard who was now involved in a 3vs3 situation. However, Chelsea’s decision making was once again too slow and poor, resulting in nothing materialising from this attack. 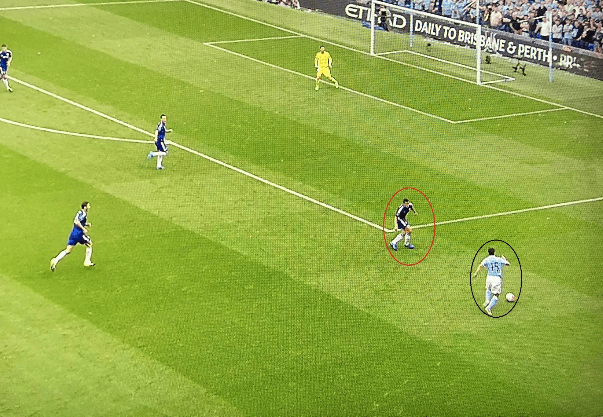 In order for City to prevent this possibility for Chelsea, both Toure and Sterling have to be in the correct position in relation to the ball. 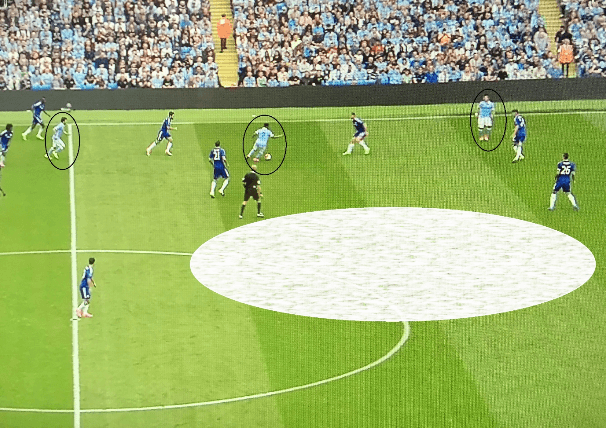 Toure has to be deeper to press Hazard once he receives the ball back and Sterling has to tuck inside to keep the shape compact and provide less space to the attacking four of Chelsea. 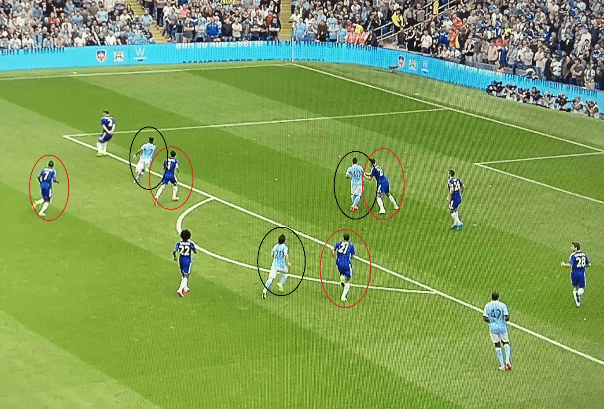 In order to try and exploit the vulnerability of City as mentioned previously, Chelsea attacks had to be effective and fast in order to create goal scoring chances. However, on Sunday, Chelsea’s decision making in the attacking third was extremely poor. Nothing dangerous resulted from the times they got in between City’s lines of play. 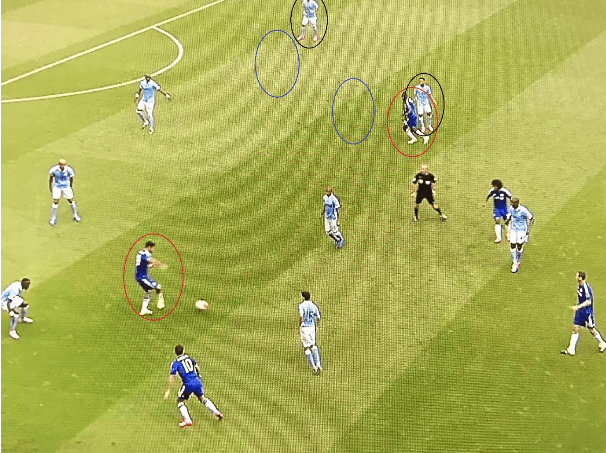 Effectively, Chelsea have broken through City’s midfield line. 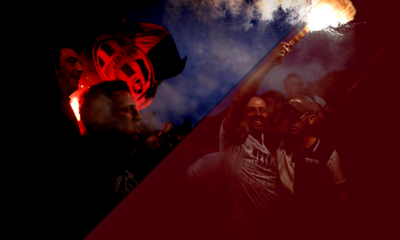 In order to gain space closer to their goal, Costa’s movement has to be effective and timed to perfection so space is created in a dangerous area. As we can see above, Costa has dropped deep to attempt and link up with Ramires. However, Ramires is still running with the ball in space, causing Costa to then move again. The further Ramires got with the ball, the more Mangala became attracted to the ball. 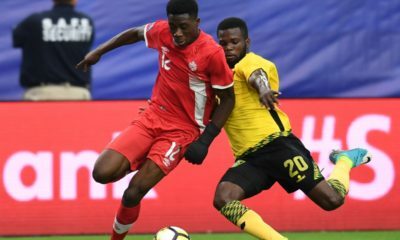 As the French defender stepped up to press the ball it was the prime opportunity for Ramires to play a pass into Costa’s path who had created an effective amount of space. However, Ramires wasn’t on the same wavelength as Costa and the opportunity of getting a shot on goal disappeared. Focusing away from Ramires’ poor awareness, let’s look at Costa’s movement more clearly. 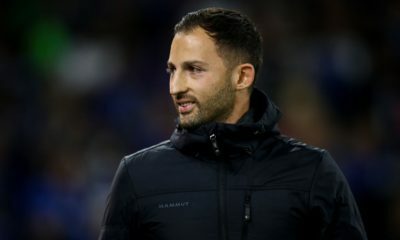 He has done extremely well to drag Mangala out of position and peel away from him into space where a player of his quality can be effective nine out of ten times. Once again, Costa has done well to create himself a good amount of space to exploit. 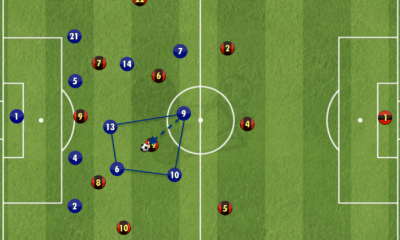 He has moved wide from his central role and then dropped deeper to receive the ball in the ‘pocket’. If he turns quickly he then has a 2vs1 against Sagna with Hazard on the outside. Whereas, inside he has Ramires making a run between City’s lines of the pitch. However, this is poor defensive play by City. 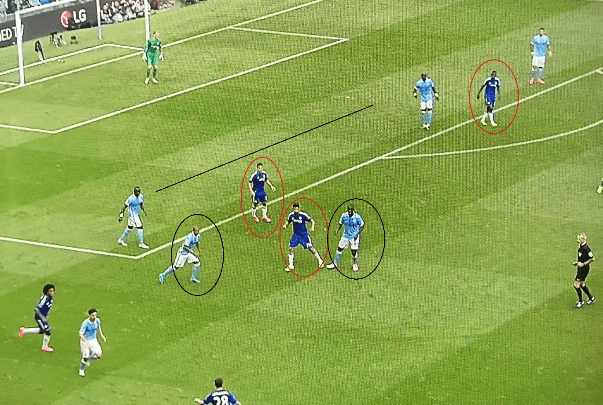 As Kompany isn’t touch tight to Costa, Sagna has to be indecisive about whether to press the striker or delay his action as Hazard is offering support. If Kompany chose to stay with Costa, Mangala and Kolarov would have to move over in relation with the position of the ball. 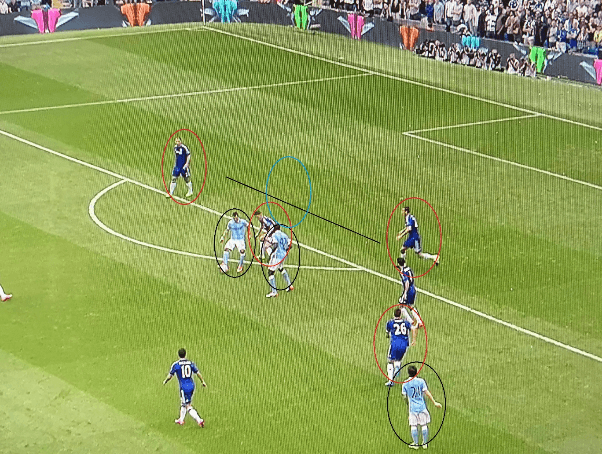 Along with dropping low to receive the ball and maintain possession, Costa has the understanding to rotate positions with the front three behind him. Pictured below is an example of this. Pictured alongside Toure is Costa. 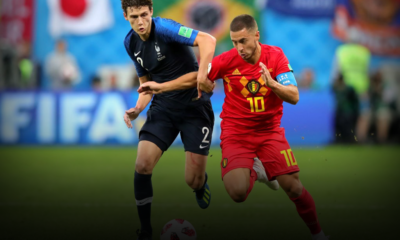 This time, he isn’t in a lot of space but has rotated well with Hazard. 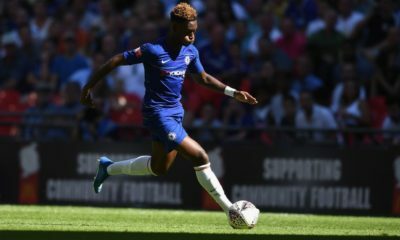 The left of the attacking three has moved into Costa’s position, Costa has moved into Willian’s position – NO.10 – and Willian has become the left of the three. This rotation is effective if the decision making within the side is sharp. However, in this case it wasn’t. Costa’s quick rotation with Hazard has created a large amount of space between Sagna and Mangala. 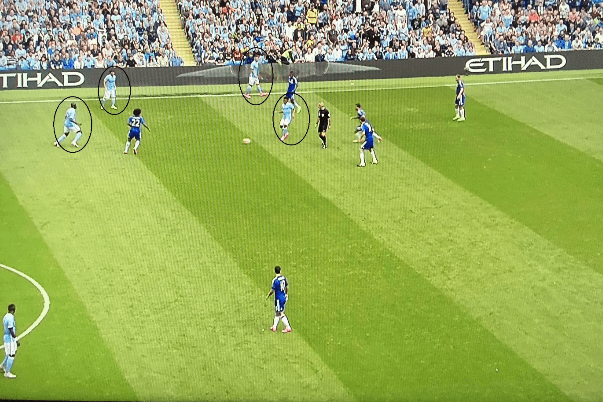 Kompany has been dragged out of position completely by Willian’s movement across the backline and into the left wide player’s position. All it takes for a chance to be created in this case is for Azpilicueta to dink the ball over Sagna for Hazard to run onto. 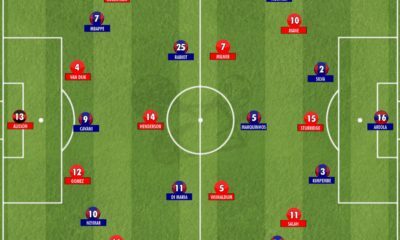 Mourinho’s teams have always been disciplined in a certain way that the opposition fail to break them down. However, this season their defensive structure has been poor. The following images will emphasise the vulnerability and how they are being exploited so easily. Before we go through everything that occurred in this image, the outcome was an Aguero shot well saved by Begovic. First of all, the positioning of Fabregas is poor. As a CDM you should be protecting your back four so there is no space for the opposition to take advantage of. However, Fabregas is doing Ramires’ job and following the run of Sterling towards the byline. 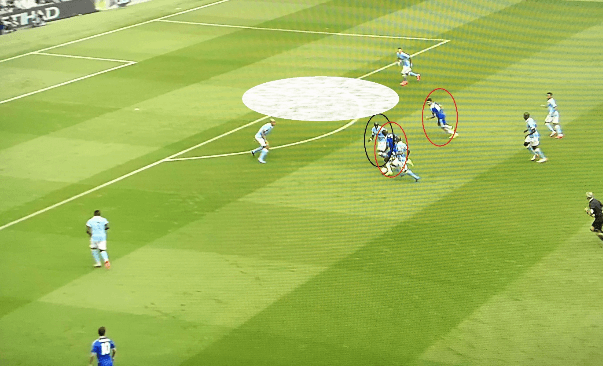 If Fabregas was over a bit more and in the D of the box, Aguero’s opportunity may not have occurred. The other CDM – Matic – has a relatively good position in this situation, Silva is making a direct run taking him out of the game (in the next screenshot we will see how). Cahill is touch tight to Aguero at the moment. Further on, as spoken about, Matic has been taken out of the defensive shape. Silva’s run was followed by the Serbian, meaning there was space in front of the back four of Chelsea. 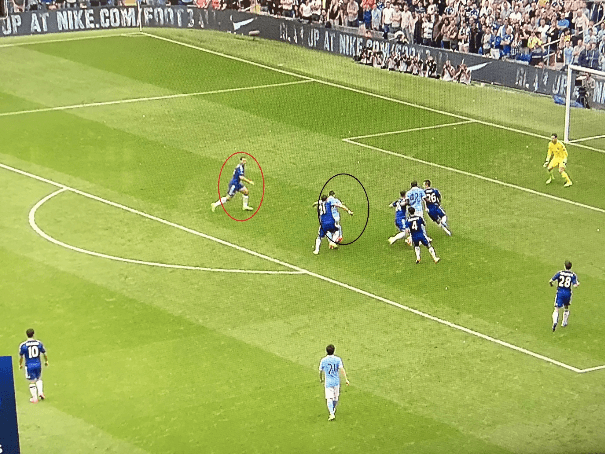 Fabregas’ poor positioning and defensive decision making didn’t help in this situation as he could have intercepted the pass into Aguero if in the correct position or even added more pressure on him from behind if the Argentinian did receive the ball. Along with the two CDM’s having a large part to play in this situation, two quality centre backs were also turned too easily. Aguero’s quick movement with the ball at his feet left the two centre backs for dead, forcing Begovic into a good save to keep the ball out of the goal. City’s goal arrived after horrible defending by Chelsea. With a team of such quality defenders, you would never expect them to look so bad when dealing with an attack. Yes City do have a good attacking team, but the defending champions should have performed better. In terms of positioning, this is very poor. Terry originally man marked Silva who was in possession of the ball before passing it to Aguero. Matic is pictured covering for the Chelsea captain, but is too deep. 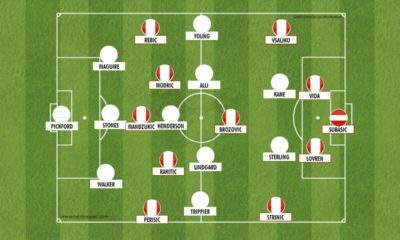 Matic should be closer to Cahill to help him prevent any combination play in behind their defensive line by Aguero and Toure. The one player who is totally out of position is the right back, Ivanovic. As he is not compact enough, he has created a large amount of space between himself and Matic (marked about by the black line). 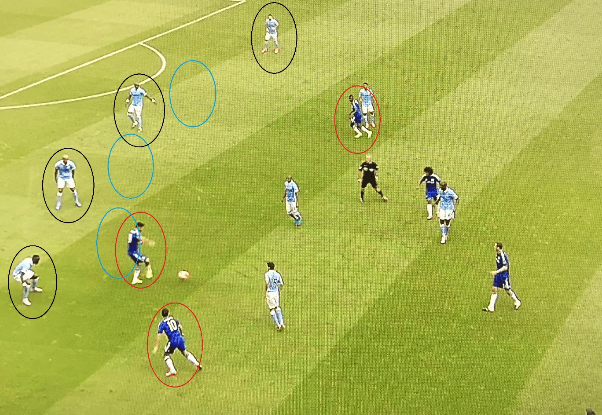 The blue circle is where Ivanovic should originally be. If he is in this position, the goal may not have even occurred. Above is just before City scored their first goal. And where did Aguero shoot from? The space Ivanovic should be in so the defensive line wasn’t so open. 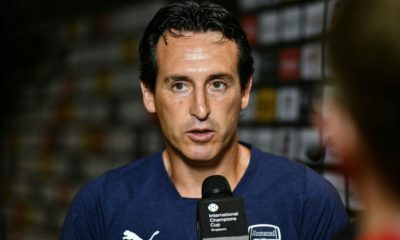 It’s clear the defensive line haven’t been concentrating enough and are making sloppy mistakes which are costing cheap goals. With pretty much the entire season still left, 5 points is far from insurmountable, especially for a team like Chelsea. What might be tougher to get over is the psychological impact. City made Chelsea look quite soft in every department. Difference makers from last season like Diego Costa and Hazard had literally no impact on the game. Mourinho better fix this and quick, because the next game is a trip to West Brom, a ground that has traditionally brought bad news for Chelsea managers. For all the errors and slip ups of last season, City now look like they’re back and hungry again. Players like Toure and Fernandinho are contributing heavily again, providing a solid base for that irresistible attack. If anyone finishes above City this season, they’re likely to be the Champions.